In a fit of uber-geekiness, I'm trying to write a history of the Calgary Cannons on Wikipedia. One of the things I really need are images. So, I wrote to the Albuquerque Isotopes, figuring they'd have some photos on file that they will never have a commercial use for, to see if they'd release some. The General Manager of all people wrote me back. John Traub, who joined the Cannons around 1990, and was the GM when the team moved south sent me these awesome pictures, released under a CC-BY-SA licence. I thought I'd share these four pictures of three of the Cannons more memorable players. I've been researching old articles, and it really is a shame that we never were able to get a better facility than Foothills. Russ Parker was fighting with the city pretty much from day one to get the park upgraded. Nearly relocated the team in 93 over a battle with the city, and openly stated the need for a new facility by 98. The city did come through at the start, and did finally help in 93, but it never was enough. Though in 1988, funnily enough, the Edmonton Trappers were absolutely jealous of Foothills Stadium - John Ducey Park was a dump. The Cannons made the playoffs four times between 1985 and 1991, Two trips to the PCL finals. In 1991, they were actually up two games to none on Tucson, but lost the last three on the road. The F'ing Mariners (struggling to maintain a .500 record) recalled our game 5 starter on the morning of the game, forcing the Guns to use a pitcher on two days rest. The relationship was never the same, and three years later, the Cannons and Mariners parted ways. I'll never forget 1998 either. Great run at the end, though they once again couldn't get the job done. Rather painful to watch the Vipers struggle to attract fans, knowing what we (Vancouver and Edmonton) lost. I think if Vancouver, Calgary and Edmonton all got our AAA clubs back, they would thrive. It's one of those things that you don't know what you're missing until it's gone. Early on Calgary was a very successful franchise, however a number of poor weather years in a row, a A-ball quality stadium and a number of parent club changes in a short period of time really hurt. Too bad. great pics resolute. I remember watching Jim Abbott very well. I didn't move here until 1995. I saw A-Rod hit a grand slam that year. The stands were packed for the game when Eddie Murray came to town for his first time in the minors since the 70s. He treated us to a HR as well. loved Cannons games, had a running conversation with a relief pitcher from the Buzz one game, telling me about how Albert Belle was a great teammate in Chicago. It was the Big Hurt who was a jerk. Neat times. I miss them as well. Anyone out there have a Cannons pennant? I'd love one for my rec room. Tino Martinez was always my favorite cannon of the early 90's which was when i spent most of my time around foothills. Funny this thread came up, seeing as how the Cannons used to be the AAA affiliate of the Mariners. A friend of mine was just called up four days ago to play for Tacoma, the current AAA affiliate of the Mariners. I would love to get AAA back in Canada. You're right, you don't know what you're missing until it's gone. I went to a game here this year, single A ball I guess, and it was great. Great ball. Had the pleasure of watching A-rod during his brief time here. 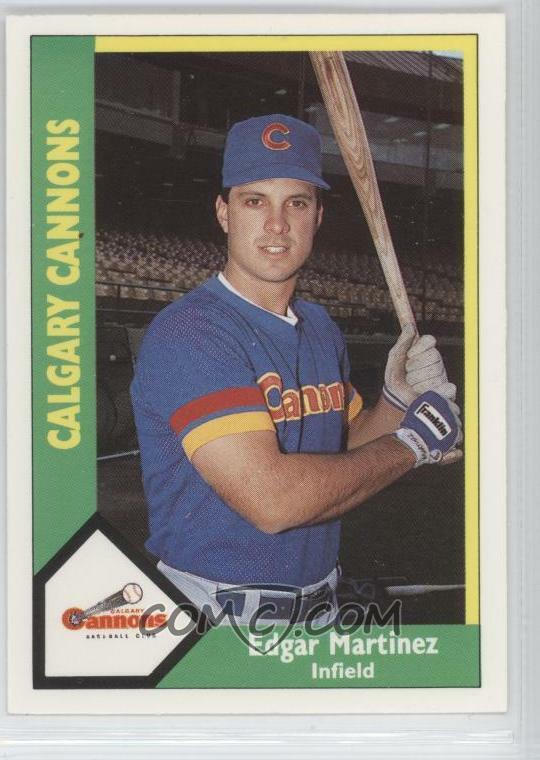 Saw a lot of Tino Martinez as well - when I think of the Cannon's he's the guy that come to mind. The Vipers' attendance issues are not at all a surprise for me. I guess it's sad as a baseball fan in this city, but it's such a huge leap from AAA to ... that. Even if we just had summer A ball here or AA or something, it would be a giant step up from the Golden League or whatever it is we have here. Bad facility, bad ball. Why would people go? Drive out to Okotoks instead - better facility and a better oganization. ...and super solid baseball. those collegiate players can really play. good stuff. The Vipers are actually a really good ball team. As for the organization, it ain't great, but compared to what I have to deal with up here in Edmonton, well, Vipers fans should thank the good Lord for small miracles. I was very disappointed when they dug the football stadium out of mewata and put up that skate park. I always thought it would be a great place for a 4000 seat ball stadium. They'd do well with afternoon games. But I guess the 13 year old stakers who need an elaborate park come first. Anyway, I remember Tino, Brett Boone, Danny Tartabull, Dan Valle, Harold Reynolds and Mickey Brantly. Lower ball? Not really. At least the Dawgs are kids still learning the game. The Vipers are a the baseball equivelent of the Colonial Hockey League. Guys that never will get a shot. The Dawgs put out a great product, and are a classy organization. Undoubtedly. They are comparatively close teams, though the overall quality of the leagues are wildly different. I'd probably rate the Dawgs equivalent of short-season A ball, and the Vipers as A-advanced. The WMBL as a whole, however, has a massive disparity in talent that does not exist in the GBL or NorL. As far as the Cracker-Cats situation goes, it seems odd today that my fear for pro ball in Alberta is that Edmonton is going to go down the drain and take Calgary with it, as opposed to what happened with the Cannons and Trappers. Great pictures! I spent a solid half hour looking for Cannons pics not too long ago, specifically of A-Rod, to no avail. Totally true on whoever said you dont know what you have until its gone. I miss those games. I miss pickin on Wabash too, that lazy bugger. I recall going to a few games when it was 30+ out and thinking that you couldn't pay me enough to be in that Wabash outfit. I didn't move here until '98, and the first Cannons game I went to, Tacoma was coming into town and for some reason their plane was late. So an hour after the game was supposed to begin, the reports were the team was on the way to the park and king cans were half price until first pitch (which happened to be around 9pm). I went to a bunch of games my first few years in town. It was hard to believe the difference in attendance between when I first moved here and it was a pretty full park, to the later years when you could hear individual conversations. Dunno who decided that, but Tartabull's 43 home runs that year was the most by anyone in professional baseball. I went to the last game in 1998 and a lot of games prior to that. It was lot of fun. Climate is too crazy in CGY for AAA baseball. Only reliable months weather-wise are July and August. Snow in April, May, rain in June, frost in Sept.